With Tilson Thomas, Grimaud, musical ideas are variously absent, very present. Who was that traditionalist on the podium Thursday night? No piece of music plays itself. 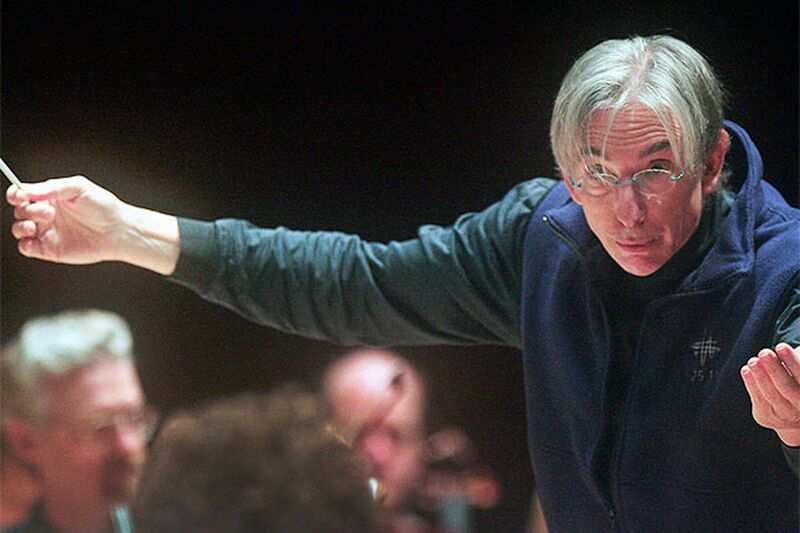 But Michael Tilson Thomas, guest-conducting the Philadelphia Orchestra in Verizon Hall, was content to let the Berlioz Symphonie fantastique unfold within the narrow bounds of standard interpretation. At 68, Tilson Thomas executed some wonderfully balletic moves, though their musical benefit was, at best, hazy. As an artistic statement, this could have come from any number of competent conductors. The emphasis fell upon the players, to whom Tilson Thomas yielded the lion's share of credit in ovations. The degree to which it was deserved varied. It was not a great night for the orchestra's woodwinds, though English hornist Elizabeth Starr Masoudnia was admirably solid. A few moments in the evening even added to evidence from the last few seasons that a couple of veteran players should begin thinking about putting the ensemble's interests above their own visions of perpetual ensconcement. The highlights: a chance to hear harpists in two distinct shades, the deep warmth of Margarita Csonka Montanaro against the brighter Elizabeth Hainen; a wall-of-sound brass section; and percussionists agile in all manner of effects. The absence of ideas was unexpected, coming as it did after a Brahms Piano Concerto No. 1 of genuine depth. The fascination emanated from French pianist Hélène Grimaud, though only partially. Even before she entered, Tilson Thomas was making points. The opening storm is, of course, all Brahms. But the conductor greatly reduced the speed and volume at the appearance of the second theme, making that music seem all the more wan and desperate. The contrast suggested more of a spiritual kinship with the Brahms Requiem than with his second piano concerto (which had originally been scheduled before music director Yannick Nézet-Séguin canceled). About Grimaud. No doubt her performance branded her quirky in the minds of some listeners. In spots, her sense of rhythmic freedom was so liberal - nervy, really - it would have left guesswork in its wake for anyone not familiar with the written score. More important, however, is the fact that the universe of pianists at the moment is filled with individualists, yet Grimaud still embodies qualities no one else has. Moreover, her ideas pack an enormous emotional punch. She had great brawn in the first movement. In the second, she was the quietest of pianists, and despite battling an instrument that grew tinny in the middle-upper register, her expressivity never flagged. Certain moments in certain performances resolve, once and for all, questions of interpretation. In the second movement, before the plaintive minor clarinet solo, the music all to herself, Grimaud had one such passage: a stretch of expressive clarity so moving you could only call it truth.